Falvey Memorial Library :: What’s Happening with David and Goliath (“The Triumph of David” attributed to Pietro da Cortona)? What’s Happening with David and Goliath (“The Triumph of David” attributed to Pietro da Cortona)? Kristin deGhetaldi, conservator, University of Delaware, and her interns, Maggie Bearden and Ellen Nigro, have been diligently cleaning “The Triumph of David” located in the Falvey Hall Reading Room. Cleaning is performed inch by inch: moistening a small cotton swab in solvent, using the swab to clean a small area and then discarding that swab for a fresh one. “What size area do you clean?” I ask Bearden, one of the interns. She explains that it varies according to how much varnish or overpaint is present. She shows me a pure cotton swab she had been using; it is filled with a brownish-black substance – discolored varnish. Once the swab is filled with varnish or overpaint, it is replaced by a fresh one. The lower half of the huge painting has been cleaned, and deGhetaldi and Bearden and Nigro are now cleaning the top half, working from a scaffold. What is newly visible? When I examine the painting today, I first notice a number of brilliant white areas—our eyes are drawn to white. I see some places where the bare canvas is visible, some bright colors that had been obscured by the dark varnish and, for me an art historian, an exciting discovery: some visible paint strokes. 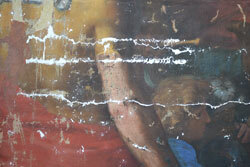 The brilliant white areas, I learn, are fill added by the conservators in places where the original paint is missing. Later in the conservation process they will inpaint those areas, using materials that are archively safe and easily removed if needed. 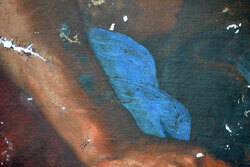 Large expanses of bright pink and lapis lazuli blue, previously hidden under the discolored varnish, are now visible. The presence of the large amount of lapis lazuli – on a blue dress on the right side of the painting – tells us something about the patron (the person who originally commissioned the painting). Lapis lazuli is a gemstone that is finely ground to make artists’ pigments. When “The Triumph of David” was painted, the only source for lapis lazuli was a mine in Afghanistan. Because this stone was so expensive, the patron could specify how much money the artist would be allowed to spend on this color in a painting. Also visible in two areas are brush strokes known as impasto. The Renaissance concept of a painting was that it was a window on the world; to create this illusion, the means of creation had to be concealed. Beginning in the Baroque (later 16th and 17th centuries) some artists used touches of impasto in their painting, and this practice expanded; in Impressionism entire paintings are filled with impasto. The two areas of impasto in the David and Goliath painting fascinate me because here are the visible brushstrokes of the master himself (or perhaps a trusted apprentice). In discussing this painting I use the word attributed with the artist’s name, Pietro da Cortona. Why? No documentary evidence exists to connect the painting to the artist – no contract, no signature on the painting, nothing. According to George T. Radan, PhD, (Villanova University Art Collection: A Guide, with the Rev. Richard G. Cannuli, OSA) the University accepted the donor’s attribution. What her evidence was is unknown to this writer. Pietro da Cortona (1597-1669) (born Pietro Berretini in Cortona, Italy) is a major Baroque painter and architect who appears in numerous art history textbooks. Unfortunately, I have found no monographs in English and my Italian is limited, so information about him must be drawn from textbooks, art encyclopedias and art dictionaries. He is widely acknowledged as one of the three most important Italian Baroque architects, and he is also considered a major Baroque painter. Cortona (named for his home town) worked for many wealthy, influential patrons. Wouldn’t it be wonderful to discover who commissioned “The Triumph of David” and to document that it is indeed the work of Pietro da Cortona? 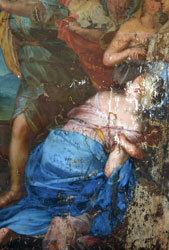 If you have time, please visit the project and talk to the conservators. DeGhetaldi, Bearden and Nigro will readily answer questions about their work. They usually work Mondays, Tuesdays and Fridays If you cannot visit in person, this live feed shows them at work. Article written by Alice Bampton, digital image specialist and senior writer on the Communication and Service Promotion team.